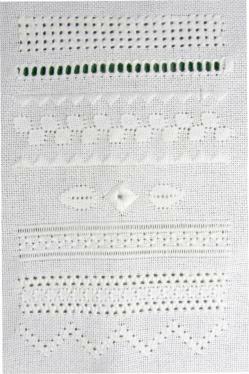 This white work sampler was first released as a stitch-a-long for subscribers to my newsletter. I have now added it to the site so everyone can have a go. This sampler is designed for beginners to whitework techniques and I will guide you along the way with full instructions and diagrams for each band. Measure 4 inches down on your fabric to find the top of our first band of pulled work. Count 36 threads left from the centre (found by folding the fabric in half lengthwise) which will be the beginning of stitch 1 on the diagram below. 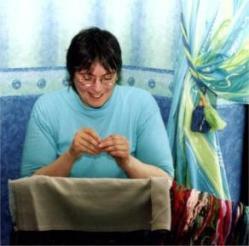 You will find it easier to execute the stitches if you pop your work into an embroidery hoop; a 7 or 8" hoop is ideal. This stitch is worked in diagonal rows and I have coloured each of the first four rows differently to make it easier to follow. Please note that you will be using white thread throughout, not coloured! I have also shown the direction the thread will follow on the back of the fabric, behind the grid, by similarly coloured lines for the first two rows. As you work pull firmly on the thread to "scrunch up" the fabric threads and create small holes at the beginning and end of each stitch. So, following the chart, below, let's stitch our first band which is worked over 4 fabric threads. You will see that the fourth "square" in the top row has a small green dot inside it. This is where we are starting, and it corresponds to stitch 1 in the diagram below. Bring the needle up at the left hand side of stitch 1 and go down over 4 fabric threads in the direction of the arrow. Bring the needle back up four threads lower and to the left to start stitch 2. Then reuse the first hole to finish the second stitch. The thread carried behind will be in diagonal lines. Bring the needle back up to work stitch 3, again in the direction of the arrows (remember to pull firmly) and reuse the same hole from which stitch 2 emerged. Continue in this manner until you reach stitch 8. After stitch 8 you will carry the thread diagonally across to begin row 2 (shown in pink) with stitch 9. Then continue in the same way up row 2, with vertical and horizontal stitches on the front of your work and diagonal ones on the back. 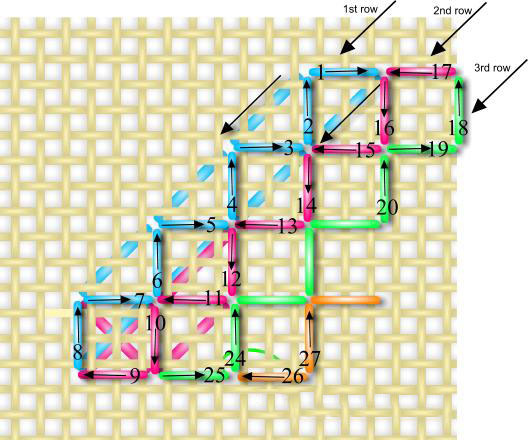 Begin row 3 in the same way following the numbered stitches on the diagram. The beginning of row 4 is a little different. When you have completed stitch 25 turn the work over and slip your needle through the back of stitch 24. This prevents the thread carried across the back from showing behind the hole at the end of stitch 25. Bring the needle back up in position for stitch 26 and then carry on as before. When you reach the right hand end of the band, you will finish each row as shown on the chart to give a straight edge to the band. Then turn your work upside down and rejoin your thread behind the back of existing stitches to work the "missing" stitches in order to square up that end of the block as well. Next time we will work a simple band of drawn thread work, or simple hemstitching. Many people get confused by drawn thread and pulled thread, but once you have completed the next band you will know the difference.